It's wonderful when a customer brings in something they have made using good stuff from the shop! 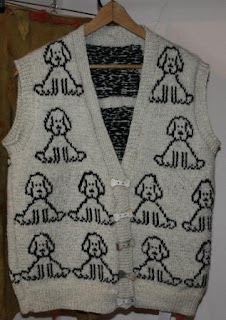 Just last week, one of our doggy friends brought her mum in to show us this great vest mum has knitted - and finished off with Soewn Earth's bone buttons! They went on the Million Paws Walk wearing it. How cute!! Trace Willans of Soewn Earth makes these unique smoke fired earthenwear buttons. 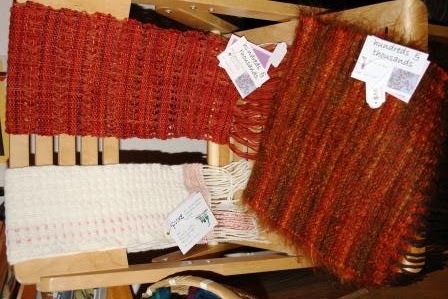 I love to use them on my woven things and they make stunning statements on all things fibre-ous. We have a good selection from $3.50 - $4.00 each. 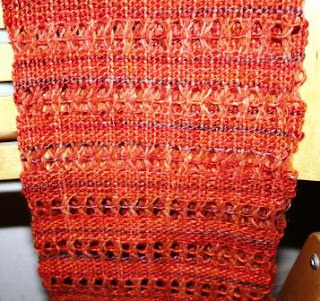 I've been busy too....latest offerings include 'Silk Road' in (Wendy Koolhof hand dyed) mulberry silk on a 50% wool/yak warp ....extremely light and tactile - first time I've worked with Yak fibre - it's so so light - and I'd hand dyed it too at Wendy's workshop back in May, so doubly pleased......'Forest Walk' in Te Awa mohair on a silk warp....and another Pure scarf featuring mill spun Tasmanian superfine merino with a super laceweight silk accent in oranges and red (also hand dyed by Wendy). Why won't it go right way up???? Oatlands Handmade is indeed "scarf city" at the moment...all sorts of gorgeous things to wrap around your neck to be warm and beautiful - Aujke Boonstra's textile creations, Juju felt fantastic - scarves & chokers, Mahdi Chandler's colours of the rainbow on silks, satins & cottons and a new range - hand knitted luxury alpaca from Frog's Hollow Retreat - scarves, beanies & berets. ...come and see us this weekend!